Although it seems like something that's a permanent feature of the phone system, 911 is a relatively recent innovation. This year actually marks the 50th anniversary of the first 911 call, between two Alabama politicians. Nearly a quarter billion 911 calls are now made each year in the U.S., with up to 80 percent of them via mobile devices in many locations, according to the National Emergency Number Association. In this context, next-generation 911 (NG911) platforms must improve failover and caller location, while retaining the life-saving reliability usually associated with legacy 911. Software-defined WAN technologies make these goals realistic. They support converged IP network infrastructure for voice as well as data services, providing access to bandwidth across multiple links for real-time adaptability and predictable performance. Slow failover to backup circuits, in situations when each second can be the difference between life and death. No support for text messages, photos or videos, at a time when over 80 percent of Americans have mobile phones. Relatively poor location accuracy, unless you're using a landline. Mobile callers transmit nothing to PSAPs except their phone numbers. Enter next-gen 911: NG911 is superior to old-fashioned 911 on all three counts, due to its basis in packet-switched networking, which allows it to meet new requirements for accuracy and multimedia support among an increasingly mobile caller base. As such, it's the ideal solution to the response challenges created by wireless devices, assuming it has sufficient underlying infrastructure for distributed call control, acceptable responsiveness and high reliability. An SD-WAN can serve as the guarantor of a NG911 implementation by ensuring a failsafe last mile, empowering dispatchers and increasing the value of its IT investments. Every fraction of a second matters in 911 response. A Talari SD-WAN rises to the occasion by offering unidirectional measurement of jitter, latency and packet loss, enabling sub-second response to any issues around the network, as well as packet and flow replication. Accordingly, mission-critical traffic for applications such as VoIP and video can be securely directed down the best possible paths at a given moment, regardless of their underlying transport. PSAPs can leverage options such as Metro Ethernet, MPLS, commodity Internet and T1, in accordance with their current investments, budgets and performance requirements. Many municipalities have shifted to NG911 in recent years, including some of the most populous counties in the country. Proposed legislation in the U.S. Senate has even focused national attention on the need for "the advanced functionality, interoperability and capabilities that come with the adoption of new, digital communications technologies" in 911 systems. With SD-WAN, this transition to more effective 911 is within reach. 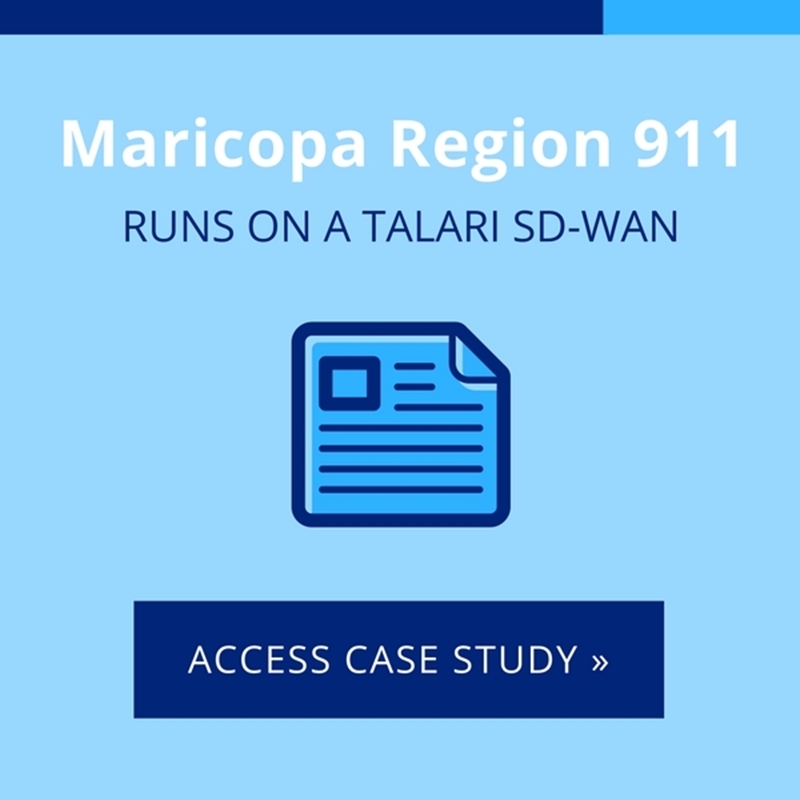 Click the banner below to find out more about how a Talari Networks SD-WAN can make safe, secure and scalable NG911 into a reality.